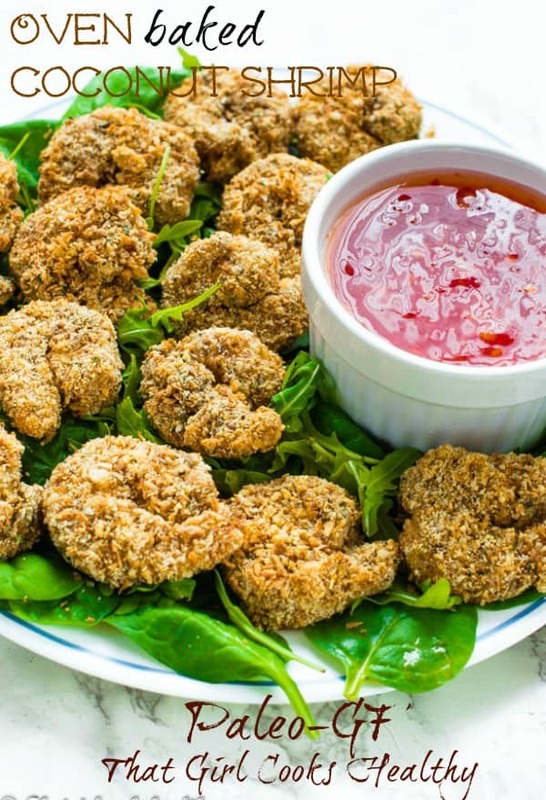 Oven baked coconut shrimp recipe – Seafood lovers will go crazy for this paleo coconut shrimp. A crispy grain free seasoned exterior that is baked in the oven making it a healthier alternative to frying. 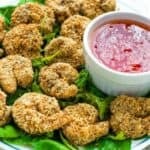 If you are a BIG fan of all things seafood then my oven baked coconut shrimp will not disappoint. 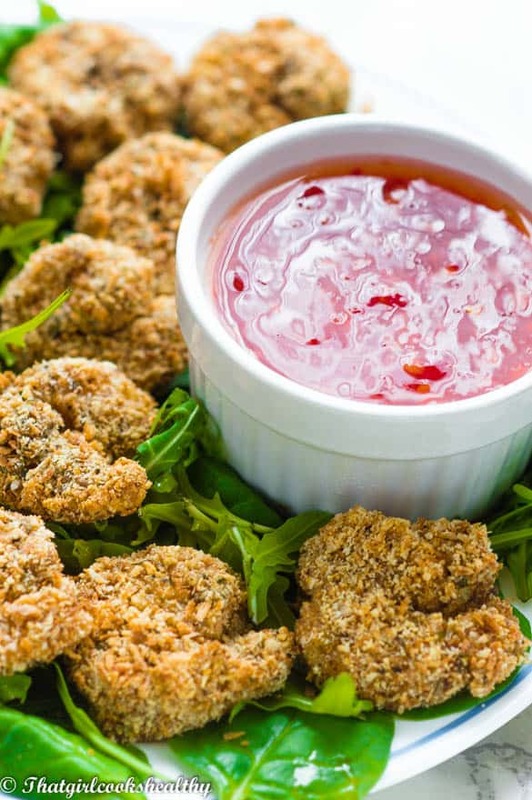 This crispy shrimp would make the perfect appetiser or side dish especially if you’re host a dinner night. Its so delicious and not to mention light on the hips, you will be requesting seconds. Let’s talk more about seasons – spring and summer! Two of my favourite seasons for light culinary delights. During the spring time is where I slowly transition from the dense stews to more light bites and salads. 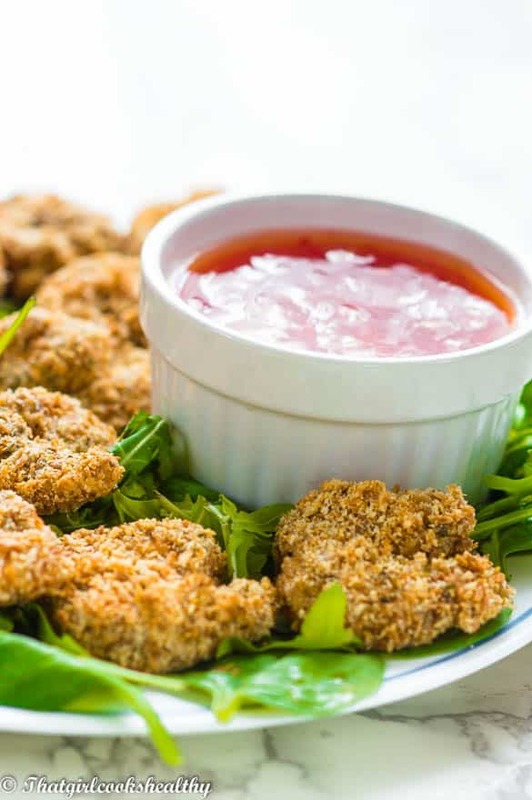 A good example of a light bite is this healthy coconut shrimp. Makes a really good side serving with complex carbs such as cassava fries . It’s homemade and made in the oven for a healthier option. Regardless of whether you choose to add extras to this recipe, you will love it. It’s very simple, healthy and taste delicious. My choice of coconut shrimp dipping sauce was sweet chilli which was really complimentary. Unfortunately we had a bad thunderstorm here, therefore, I was unable to provide step by step pictures because the lighting was so dim. By the time the sky was bright I had already baked the shrimp and was ready to shoot the final shots. As mentioned earlier, the recipe is very easy to prepare, but do make sure you follow the instructions to the tee. 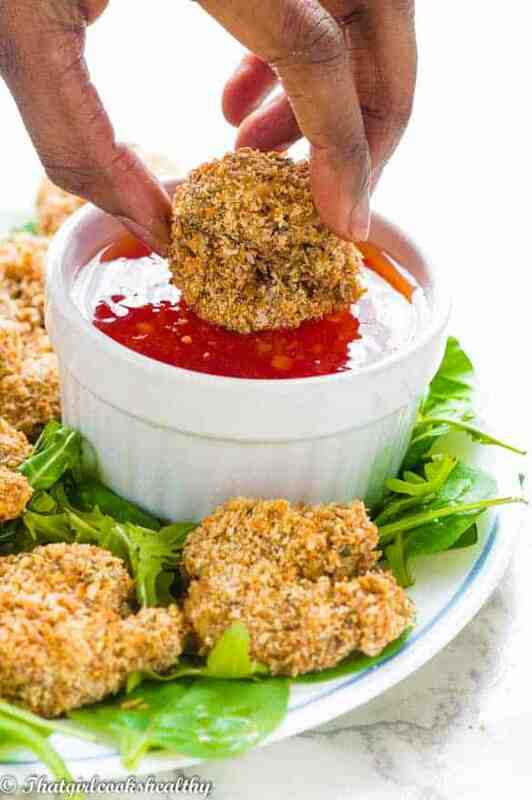 You will be dipping and dredging the starch-to-egg-to-breading (aka coating). In that order, so please do not skip and/or rearrange the formula of how the recipe is written. The shrimp I used was raw and devained which takes a few minutes to complete. I double amount of seasoning used from when I did my recipe testing and simply divided it between the three bowls (shrimp, starch, egg and coating bowl). A great tip that I’ve learnt from doing this several times is to toast the breading in the oven a head of time. Toasting the coating really enhances the flavour of the coconut and yield more crispiness when baking the shrimp in the oven. If you cannot obtain a packet of mixed herbs simply create your own by combining 3 tsp of thyme, parsley and majoram mixed together. 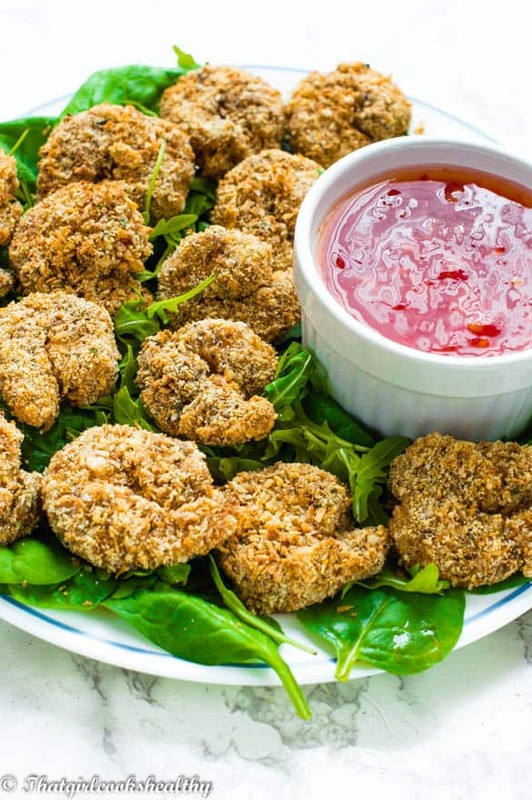 Delicious oven baked coconut shrimp – so much more healthier than frying!! Pour the coconut and almond meal onto the parchment paper, mix them together creating an even layer where possible. Toast the coconut-almond mixture for 3-4 minutes, until golden brown. Once toasted mix again so the darken coconut parts are evenly mixed with the lighter almond meal. Place the shrimp, the tapioca starch, eggs (cracked), and coating in separate bowls side by side in that order. Add the himalayan pink salt to the bowl with the coating. 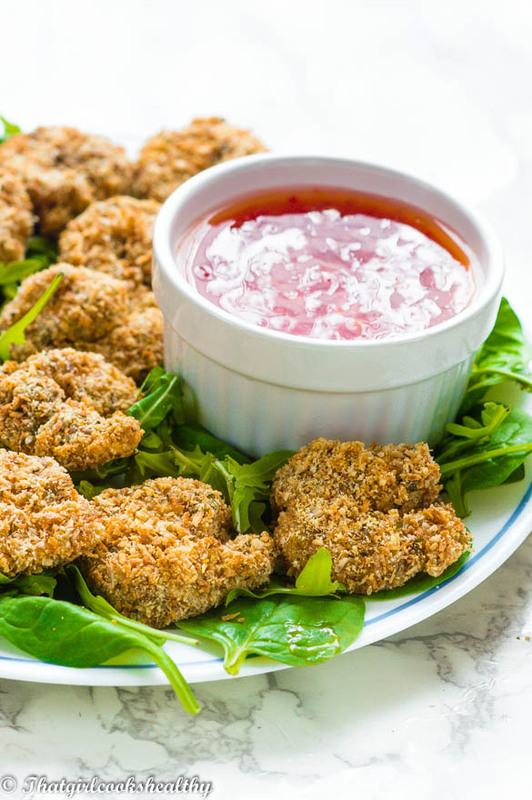 One by one, dredge each shrimp in tapioca starch, then dip into the egg and then finally roll in the breading (coconut mixture). Place the dredged shrimp onto the baking tray with a gap in between each shrimp. Bake in the oven for 8-10 minutes until the shrimp are pink and the exterior slightly more golden in colour. Serve with dipping of your choice or with oven baked fries.